Russian Impressionist masters were unknown to the West for a long time due to the Soviet block . Their time frame of 1930-1980 is becoming more in focus due to U.S. galleries and Japanese collectors. A US gallery:Thomas Kearns McCarthey Gallery is located in two places: Park City, Utah and St.Petersburg, Russia. 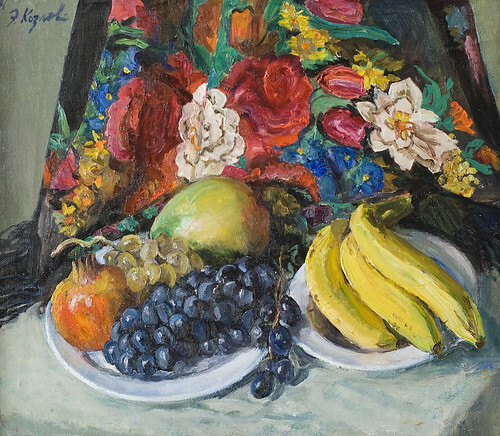 McCarthey gallery collects dacha art: the great Russian Impressionist masters. The heritage of Russian creativity is immense from Tolstoy to the Bolshoi Ballet. The period of Russian Impressionism 1930-1980 added positively to their tradition of art. Impressionist artists desired to express the lives, hopes, joys, and other emotions of the common folk in Russia. Keeping a strong preference for painting the land and people of Mother Russia, these painters did not adapt to Western art. Impressionism in Russia comprised three stylistic parts. The first was classical art dating to before 1950 . Most art originated from the Soviet academy and the approach to art was low-key and nothing too disruptive or shocking. There was not much of an inventory of paintings from this period. The next phase was the impressionism of the working class. Art had a positive edge which was accessible to the masses. Subject matter included farms, landscapes, industry, portraits expressive of sensitive emotions, and interior still life paintings. This working class art peaked in 1950’s to the 1960’s. The third period was the rough and severe style . These paintings began to employ a modernist approach while still making a socialist statement. Intellectually what characterizes the art of 20th century Russian impressionism? Freedom of expression, vibrancy, spontaneity, and honoring “the soul” of Russia’s people. Painting plein air and alla prima, using a light palette, full and heavy brushstrokes and bold colors are strategies used by these artists to achieve the goal of glorifying Russia and its unadorned everyday life with the resilience of its people. A comparison to the French Impressionist artists like Francois Millet, Gustave Courbet, or Edouard Manet may be close in similar style and intent. In Russia these impressionist artists, especially those living, are treated like Hollywood stars. At the Surikov Art Institute in Moscow, works by Yuri Kugach, one of the oldest living masters , has paintings gracing the Institute’s walls. Kugach is a family of artists across generations similar to the Wyeths in the eastern US. Yuri Kugach maintains a studio or “dacha” in the middle of an apple orchard. He paints there on location everyday. Now collectors worldwide are saying that Russian art is “hot “ because the galleries have discovered “realism”. From Andrei Rublev and orthodox iconography to avant-garde painters K.Malevich and W.Kandinsky, much study, training, and work has occupied these “realist” artists who are becoming known in their own right.